Amazon.com description: Product Description: Applicable for both qualitative and quantitative researchers who work within a critical theory paradigm, Dialectical Research Methods in the Classical Marxist Tradition utilizes Marxist principles in aiding the design of inquiry whether at the undergraduate or graduate levels. Included in the text are issues related to social justice, what distinguishes Marxist research from other liberal-left paradigms, how mainstream research is used to support imperialism, re-evaluating ethics, and various forms of data collection. As a point of intellectual inspiration, the text will introduce both familiar and lesser-known names of those engaged in dialectical materialist inquiry past and present. Readers are first introduced to the features of Marxist research, followed by an overview of how research is currently used in academia and industry. 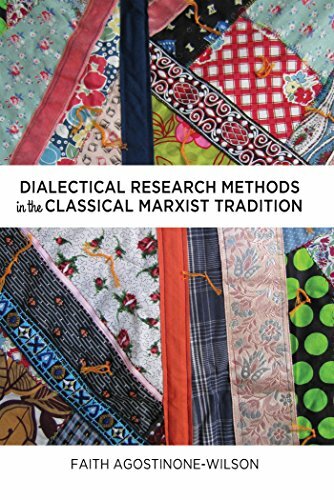 Next, the text presents descriptions of dialectical research from both qualitative and quantitative traditions so that readers can access a sampling of existing inquiry. Finally, various forms of data collection and design considerations are laid out in an accessible manner, so that readers can begin to formulate their own research proposals.